We do not run companies, but we are entrepreneur friendly and assist you in growing yours. There is never a clear path on what choices to make when building your business. RedHouse executives may see opportunities you are missing or offer suggestions that help define your choices. As proven entrepreneurs, we have experienced many of the questions startups encounter and can leverage that history to assist you in avoiding common pitfalls and maximizing your opportunities. RedHouse can offer guidance and support you as you grow from one stage to another. We believe in a “Work Hard, Play Hard” mentality when it comes to building a startup company. Ultimately, the success of any technology company rides on the initiative and skills of its employees. It takes a lot of hard labor and long hours to make a company successful. We can help you create an environment that will enable your team to succeed, and maybe have a little fun too. First and foremost, we look for great entrepreneurs who have identified a customer need. Our experiences have taught us that there is no greater condition for successful startups than its talent. We can assist organizations in the development of their product, a go-to-market strategy, sales plans and organizational development. We have many years of experience in Information Technology, including Software, tools, Internet, hosting, etc. We believe in technologies that are driven by innovation and market forces. We do not provide direct venture funding through RedHouse Associates, but we can assist you in targeting and gaining access to seed and venture investments. Our team of advisors has personally made numerous, private small-seed investments in technology startups. We assist you by advising you on capital financing transactions helping you promote your business to venture capital partners for larger seed investments or later stage Series A/B rounds. Seed Investments can be made relatively quickly for most companies. We tend to focus on small-to-medium businesses at alpha or beta stage to prove market validation. These rounds typically require fundraising in the range from $50 Thousand - $500 Thousand. We want to be an involved player and help you get to the next stage. Preferred Rounds are larger investments, typically over $1 Million, and are for companies that are past the beta-stage and ready to go-to-market in a big way. We typically help you find a lead investor. We draw upon the expertise of the RedHouse Associates network and maintain a deep relationship with the entrepreneur in overall company planning and capital strategy. Because it has been very Lucky for us! This old Houston area mansion at 802 Lovett, called the “Red House”, has been the home to very successful startup technology companies. We want to continue this success with you. The Advisors at RedHouse Associates work closely with promising, talented entrepreneurs looking to build great businesses. Our team is made up of proven entrepreneurs and senior executives that have experience in starting and growing successful organizations. Depending on the type of assistance a company may need, we take a small equity stake in the business and then inject the collective talents of the RedHouse advisor team into your company. 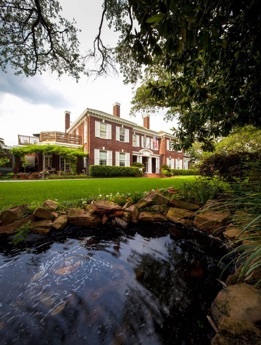 Located in an old red brick mansion built in the early 1900’s, our office has been the home of a turn-of-the-century oil baron, and an architect that helped design the Astrodome and major buildings dotting the Houston skyline. But more recently, it has housed a number of very successful startup technology companies. The “Red House” fosters creativity, teamwork, and success. It also seems to have that elusive karma where hard work brings great rewards.